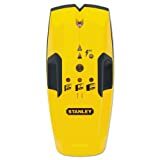 ▷ Stud Finder Reviews 2019 🥇 » Which stud detector should I pick? 8 Review guide: Which stud detector should I pick? You you may have seen those devices before on home depot shelves, or when getting a carpenter to help you out fix some issues at your home. A stud detector is basically a device that helps you locate specific frames behind your walls, called “studs”. Studs are a core part of wall-framing in house engineering designs for Western Houses (specifically the UK and the US). To be brief, a stud is the underlying frame structure that keeps building walls up. Without them, the walls would collapse under the weight of the building home. Of course a question you may want to ask is “why do I need a stud detector., if my home is already set”? Stud detectors you see, help pinpoint studs for wall-nailing activities. Considering that studs tend to be the strongest part of a wall structure, they tend to be perfect for supporting shelves, hangers, and basically anything that you need to go on a wall, while carrying objects at the same time. Overall, this means less drilling and nailing, saving you useless punctures in your wall structure. Alright, we believe it’s time to look at the options available to you. Below, we’re going to show you the top 7 stud detectors you may want to consider for future use! We see it best to start this list with a high quality gadget on the market. Zircon, while a small company in the sensor market, has a reputation for creating stud detectors with extremely high accuracy rates.Accuracy rates here refer to accurate detection. With the e50 design, accuracy manifests itself in edge and depth detection. The e50 design can accurately pick-up on stud edges, allows you to pinpoint exactly specific areas where drilling or nailing may be harmful for the structure. Nailing and drilling activities in a stud edge means that the structures you choose to hang on your building walls, may not be lodged into the wall properly. With depth detection on the other hand, the e50 design can detect studs up to 38mm, where as regular competing designs may have a maximum of 18mm. This is due to the designs ability to switch between a regular scan mode of 18mm, and a deep scan mode of 38mm. This allows wider use of the sensor for many different wall-framing depths. Additionally, the e50 design allows easier reading of stud detection through the LCD screen feature. Most stud sensors tend to signal detections through beeps, or through unclear screen signals. As such, the LCD feature for this sensor allows for both professionals and amateurs to use the device, while understanding the signals being given off with ease. This product has 3 features that make it an excellent fit for you. Those would be size, ease of use, and magnetism. 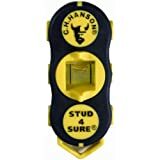 The CH Hanson is one of the smallest stud detectors available on market, and one of the least electronic in design. This allows for both portability and durability, making sure you never need a new device, while also making it easy to carry around for use. To emphasize, the durability does not come from the manufacturing material, but from the lack of electronic detection measures of the device. Less electronics means a lower likelihood of wiring problems, battery problems, and even issues with the detections signals (whether sound or visual).The lack of electronics in this case is replaced by the use of magnets. Magnets may unfortunately seem like a primitive technology for most people, except that for stud sensors in general, magnets tend to be more effective than electronics. One of the main problems with electronic sensors, is that they have a difficult time distinguishing between nails inside studs, and piping systems. This is not the case with a magnetic system, where detection occurs only for nail studs, but not pipes. As such, in terms of practicality, this device has a higher accuracy rate than most sensors. The previous 2 examples emphasized ease of use for both experienced and non-experienced individuals performing carpentry tasks. This device on the other hand may be considered a “high tech” alternative, and will mostly apply for professionals. You may still use it as an amateur if you wish, although the many specs available for this sensor may be unnecessary for you.This specific model falls in the $50-$80 range, making it one of the most expensive for use. The 3 features to take into consideration with the ProSensor 710, are width, depth, and range of detection. Most stud detectors will focus on finding one stud at a time. This is not the case with this model, where the Advanced Multi-sense Technology allows for the detection of multiple studs at the same time. This is emphasized by the LED signaling system, and also the width of the device, reaching close to 7 inches. Depth is also not ignored with this model, reaching a default depth of 1.5 inches, or 38mm. This matches the deep scan mode of the first model, while providing a greater area of reading than the other models. Returning to ease of use once more, the SF100 model is best fit for beginner users, and works perfectly for work that needs to be done for home walls. 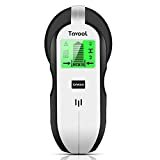 This specific device hosts 2 features that allow for easy handling, being the detection measures, and the accuracy markings.Signals are easy to read on this device, requiring no experience, especially considering the labels next to the beep signals. As for the accuracy measures, a marking titled “Stud Edge” exists to help the user manipulate the device, for proper stud edge detection. The ease of the SF100’s use technologically also exists in its powering system, requiring only 2 AA alkaline batteries. Since this device operates without the need for charger, an extra advantage offered here would also be portability and convenience of use at any location. This model’s simplicity is also complemented by its price. Only ranging between $10-$20, this device is easy to acquire regardless of your carpentry budget size. Being one of the most popular stud detectors used by individuals, it is often difficult to find this device in stock. 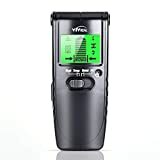 This specific model may be considered as a jack of all trades for detectors, combining technology and ease of use at the same time.This specific device comes equipped with an LCD monitor that displays a variety of signals, including both sound and visuals, in addition to the signal strength. This signal strength detection allows you to properly gauge the depth of the stud, hitting 38mm as a maximum measurement. Additionally, the device contains a centering point system, allowing for ease of detection of stud edges, pipes, live wires, and also for proper pinpointing of nailing points. Also, this device is extremely light in weight, weighing only 2.2 pounds, meaning that it is easy to maneuver, with very basic hand-eye coordination for marking. It is also easy for carrying stress when measuring the depths of wide walls. 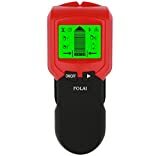 Just like the SF100 model, the FOLAI model can is easy to use by those who lack experience with stud detectors. While it is a small device, many may find the price tag quite surprising. 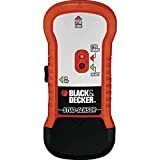 While it does fall in the $60-$80 range like the ProSensor 701, it looks for the most part like the $20 models mentioned on this list.Pricing and size do not correlate properly when inspecting stud detectors. Functionality and effectiveness are all that matter, and this is exactly what is offered with the GMS120 design. The GMS120 is a multi-function stud detector, able to detect to detect wood, metal, and live wiring. The model enables you to switch between all 3 modes, giving you a through scan of what lies between your walls.This model also contains many of the functionalities available in all previously mentioned designs, including LCD screens, audible and visual detection, and signal strength. Regardless of all the functionalities mentioned, the one spec that should be taken into consideration the most, would be the depth-detection of the model. While depth-detection for most models reaches to 38mm, this model maxes out at 121mm, almost 3 times as much as most models. This makes his device perfect for thick walls, regardless of location. The depth-detection in this case, allows the device to function for all walls, regardless of location and design. In our opinion, this is the best option for professional use. This is one of the easiest stud detectors to use of all models mentioned here. The specs of this piece are similar to most mentioned here, in addition to the similar functionalities related to beeping and audible signaling.One thing that should be taken into consideration about this device, is that use is primarily aimed towards the average home-user. This device, due to its high-degree of sensitivity, is best fit for detection of wires. You may use it for the detection of stud nails and edges, but you would require a little bit more expertise in understanding stud structures to decipher signals. This device is one of the easiest to find in the markets, and one of the easiest to understand in terms of signaling. LED signaling is used for this model, meaning that complex detections and measures by LCD screens are avoided. Of course, considering that the price tag of this model is less than $25, we do not recommend you expect much from this device in terms of depth-detection. This device, like many others on this list, will reach a maximum of 38mm. Regardless, this device does allow you to shift between 3 depth modes, each increasing or decreasing by ½ an inch with each option. This allows you to better differentiate between the signals of wiring versus stud nails. Review guide: Which stud detector should I pick? The stud detectors you choose highly depends on your needs. First, you would need to define why you want to use a specific model. For example, you may be a homeowner who wants to hang a few items on their wall. Alternatively, you may be a carpenter or a construction worker, in need of a device to do the job. If you happen to be a non-professional user, then your focus will be mostly on simple and cheap devices. High-tech expensive stud detectors are mostly for professionals, who have to deal with a great variety of stud frames and wall thicknesses. This is not the case if you’re a private user, who happens to be mostly focused on specific wall and stud dimensions.Basically, a private user will usually deal with their homes only, hence needing an option that will work with their environment. A professional will need to prepare for multiple scenarios, hence relying more on advanced specs. As such, if you’re a beginner or a private user, make sure that the detector you use combines reliability in detection, and ease of reading signals. As a private user, you should not have to suffer in terms of understanding signals and capabilities, just to be able to hang a shelf. A professional on the other hand should be well-versed in understanding detector signals and instruction manual reading, allowing for a wider range of use of different models. This guide is an attempt to inform private and professional consumers alike of the many different options available for stud detectors. Thorough information has been provided, with a focus on displaying different qualities that would interest all consumer types, such as pricing, functionality, available modes, and advantages in use. Also, advice has been presented to provide professionals and private users with information on which detectors match their specific needs, in addition to the primary advantages of each detector. In terms of detection specialty, many detectors excel at specific aspects of carpentry work more than others, whether it be accuracy and edge detection, wire or wood detection, or even depth-seeking.